The garden is not looking so rough around the edges at the moment, but is still slowly taking form as a blank canvas in areas. The back bed has been filled in and covered with the oaten hay that we picked up some months back. At the far end I have “thrown in” quite a number of different potatoes that have been floating around for quite some time. The idea being that this bed will sit for a while to allow it to break down and they will either grow or they won’t! I anticipate keeping the bed moist to get the worms involved as soon as possible. Basically, it will be a giant worm farm with plenty of material underneath the hay to keep them happy. I have only recently come across some information on building soil that is stirring my interest in the creation of good soil for high productivity. I found this article in a search at the Savvy Vegetarian site. The article raised some new concepts for me but my main attention was in the amount of carbon stored in the soil. This confirmed also other information I had come across on bio-intensive farming at the Grow Biointensive website. I have put in bold type the bit that interested me the most. In the GROW BIOINTENSIVE system, .soil fertility is maintained by allotting 60% of what is grown to compost crops. A focus on the production, through these crops, of calories for the gardener and carbon for the soil can ensure that both the gardener and the soil will be adequately fed and that the farm will be sustainable. Because this biologically-intensive method requires much less area to produce the same yield of crops as conventional agriculture, if it were used globally at least one-half of the world’s acreage could be left in the wild for the preservation of the all important plant and animal diversity. I had placed myself in a great position to begin the garden bed as two of the main crops used to build carbon in the soil are corn and sunflowers. High carbon crops. These have been grown throughout the summer and are now a part of the bed having harvested the seeds. Then I have also added a small amount of charcoal and some rock dust. 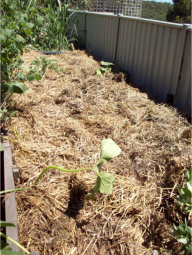 Newspaper and green clippings from the rest of the garden tidy up make the next layer and then it is all topped off with the oaten hay. My next plan, as mentioned above is to keep some regular water trickling through in areas to attract the earthworms and have them begin their important work. To further encourage this I have been researching microbes and am looking at regular additions of micro-organisms in various forms to enhance the break down of the carbon and speed up the earthworm action. I have prepared home-made bokashi which is resting at the moment before application. I also have a supply of liquid microbes that will be watered over the garden from time to time. I another area I have scattered seeds that were not the best and will use this as a green manure crop, should they even grow! 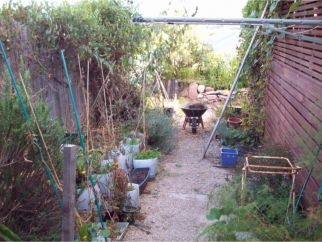 The picture to the left is the side garden where the easterly has really had its way with the plants. The choko is in recovery mode now and I expect to begin seeing flowers over the next couple of weeks. The rest of the garden is being “over-hauled” to make a greener area that is actually more drought tolerant. The left garden will be used for growing a perennial zucchini and native spinach (Warrigal Greens). Some for the kitchen but also to give the chooks a year round leafy green that is low maintenance and will fill this area of the garden with its creeping nature. The right side of the path will be a selection of drought tolerant herbs such as lavender, rosemary, dogbane, oregano, sage, thyme and perhaps some marigolds. There is the odd grapevine in both beds but these may be moved. Other beds in the garden will be planted with suitable plants or shrubs, leaving the main back bed, the aquaponics and container beds to supply most of the kitchen salads and vegetables.